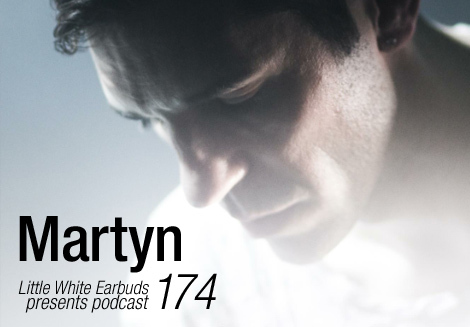 Martyn may have cut his teeth in the world of house and techno as a young lad in the Netherlands, but by the time he started releasing music back in 2007 he was mostly known for drum and bass. Later, with classic sides for labels like Apple Pips, Hessle Audio, and his own 3024, he found himself most often linked to the world of dubstep. But Martyn is not a genre artist — he’s a producer who revels in making whatever it is he feels like, synthesizing all of his influences from decades spent in clubs into a sound all his own. His two albums, both standouts from the last few years, celebrate underground dance music in all shapes in sizes, and that’s led to him to a position of renown amongst heads of various dance music strains. As LWE’s 174th podcast shows, he approaches his DJing much the same way, roaming through cuts both heady and floor-filling, both widely-loved and deeply-dug, but always with the steady pulse of 4/4 dance music at its core. As he comes off a year of busy touring, we caught up with Martyn to take a peak inside his record bag, talk about getting back into the studio, and about living in the States. Oh, and guitar pedals. We interviewed you in 2010, around the time of your Fabric mix. It’s only been three years, but it seems like a good deal has changed for you. How do you think things have changed since then for you? Martijn Deykers: Wow. Yeah, three years doesn’t really sound like it is that long, you know, but I mean I’ve done — what have I done since Fabric? Like, I’ve done another album, spent a lot of time on the label and trying to get that to a higher level as well. And also, I guess personally, just sort of getting settled in the U.S. a little bit more. When I did the Fabric mix, I lived in the U.S. for only a year, and obviously now I’m a U.S. citizen now and, you know, really sort of settled in this area as well. And also, I guess, getting in touch a little bit with other people in the D.C. music scene and things like that. So I guess I found a little bit more grounding, which I think is good. And also, just sort of doing stuff with Brainfeeder. I guess things are a little bit more U.S.-based now than they were. I don’t know if that’s a good or a bad — I guess that’s a good development. It makes you a little bit more calm about things and you’re less sort of disenfranchised in a way, which I think is good for the music. I’ve built a little studio, as well, here. So it’s more like a homebase now, and I guess I feel a little bit more calm and less sort of ADD or stressed about things than I was in 2010. What’s your read on the scene, in the U.S. and maybe in D.C. specifically? Well, I haven’t really played too many places in the U.S. I’ve played sort of the main cities. Like, I’ve been to New York a few times and San Francisco and L.A. and Chicago, and places like that. But I haven’t really played a lot of the smaller cities. But I think what’s interesting is that, the scene over here in D.C– it was funny, actually, because I was interviewed once by the Washington Post, and I was talking to the journalist, and he was a big music fan himself, and we found quite a lot of common ground in musical tastes and stuff like that. And he told me there were a lot of people in D.C. doing really interesting music, and then he started naming, a couple names like Maxmillion Dunbar and the Future Times label and stuff like that. And I was like, “Wow, I didn’t even know these people were from D.C.” I was a big fan of the music, but I never really sort of made a link with them living down the road from me. And so when I found out about that, I started to get in touch with them, and there’s a cool little record shop here that does underground house and techno stuff. So there’s really quite a lot going on, and then there’s the U Street Music Hall, which is a really nice venue that I’ve started to play at a little bit more now. I guess that kind of helps with the grounding part, you know? Because when I grew up in Holland, I was a big part of the scene there because I ran one of the main events there every month, and I was a DJ and making my own music. So I was very much involved with other people there, and sort of bringing up this little scene that we had there. I lost all of that when I started to move around and travel and live in different places. I guess that’s kind of where the whole D.C. thing comes from now. You know, just to sort of see that other people here are doing things and exchanging tips and tricks or whatever about studio work and about traveling or DJing, stuff like that, you know? That’s kind of the more local aspect of things. And then as far as the U.S. in general, I think — well, do you want to really go the sort of EDM discussion way? [laughs] Good. Well, I think the main cities, the bigger cities in the U.S., they have really healthy scenes, you know? Especially as sort of club scenes, when you don’t look at the festivals. And I think that’s always sort of been there, but maybe, I guess, by European examples, some of the clubs have become better. They’ve focused a little bit more on sound systems, and you have places like Output, for instance, which has the sort of no-camera policy. And I think all those things are sort of inspired, probably, by clubs in Europe. But it does make for a much healthier sort of club scene, you know? So I’m actually enjoying gigs in the U.S. more and more because of that. Yeah, that’s good. The old story seems to be that U.S. clubs were always a little unreliable. Yeah, or up to scratch. But I think because also a lot of people have been traveling back and forth to Berlin and stuff like that. So they come back, and they’re like, “Wow, we want to do something similar or have a little bit more freedom inside the club, while — ” you know? And also I think there’s a bit more freedom in booking, as well. People take a little bit more risks and stuff, which I think is good because you can hear different music. Do you have any examples of that, where now you’re maybe a little more interested in the parties that you’re playing? I don’t know. Not specific examples, I guess, but when I started gigging here a little bit more frequently, I was usually booked on dubstep nights. And it was very tough for me because I never actually played sort of 100 percent dubstep in my sets anyway. I always sort of crossed over to other things. And on these dubstep nights, it was very sort of rigid, like, proper, wobbly, loud, bass-line, sort of masculine stuff, so my music was always some sort of weird in-between thing, for people to go to the bar and drink, you know? So it was always kind of tough playing those nights, especially if you do you best and you play the best you can, and then the guy after you plays the biggest banger as his first track, and everything you sort of created is gone instantly. So that’s kind of where I come from, and the more sort of club-oriented nights here, especially like New York or Chicago or maybe San Francisco, it’s just a little bit more open. In the sort of 4/4 realm, there’s a lot more possible just because the rhythm is always going to be 4/4, or more or less 4/4, you know? So I think that just gives you a little bit more freedom to play what you want, and even if the guy before you plays maybe, I don’t know, like, Crosstown Rebels stuff, you can quite easily sort of transition from something like that to whatever it is that I’m doing, you know? So I think it just makes it a little easier playing 4/4, as well. And people are just a little bit more open-minded in that sense, and they can accept more, just because it has the same rhythm anyway. You mentioned a little earlier that there’s a good record store in D.C. that you find yourself going to. Are you still buying a lot of vinyl? Is that really important to you? D.C. is a big city, but it doesn’t really some like a huge dance-music city. Do you find you’re able to do a good amount of your record shopping there, or do you have do buy records while you’re abroad, or do mail order or something? Well, I think that’s another development over the last few years is that more and more music is just vinyl-only. And more and more good music is vinyl-only. And so I always sort of bought vinyl, but I guess I really stepped it up over the last year and a half or something because, I did buy vinyl, and then I would rip it, and then I used Serato before while DJing. I just got so fed up with ripping all these records, that I just started to bring them out myself, and just sort of slowly converting back to just playing vinyl again. And I guess once I do something, I want to do it seriously, so I went full-on on a vinyl shopping spree again. And now I buy quite a lot from various sources. I think, if I would have to rely on D.C. alone, I would never be able to play vinyl-only sets. But I mean it’s a good store. It’s a little one called Earcave. And they do, like, sort of rarities and some disco stuff, but they also sell, like, L.I.E.S. and Future Times and stuff like that. Actually, where is it? I was in D.C. a couple months ago, and friends of mine told me to go check it out, but I couldn’t find out where it was. I usually use their mail order because that’s the easiest way to — because I live just outside D.C., so sometimes for me it’s quite hard to get into the city. I don’t know where you live, but if you need to go to Manhattan and you live in Queens, or something. It’s the same city, but you don’t really go there if you don’t have to. But yeah, it’s a place called Earcave, and yeah, they do some nice imports and stuff like that. But I also order a lot online, and then when I go out for gigs, I go to record stores like local ones or whatever. So it kind of comes from different sources. And a couple labels just send me stuff, especially older things that I’m after. I just email the label and go like, “Well, do you have a copy left here or there,” or stuff like that. Just to sort of get everything. And Discogs obviously. But it’s just fun getting back into it, and I really notice when I’m playing out that it just gives a lot more sort of positive feedback from people because they just like to see you play vinyl. And I was never really a vinyl snob like that, or I never really got involved in that whole digital versus analog discussion at all. But I just noticed that it’s just less stressful, for me, to play it, as well. Because you don’t have that computer there, and it looks better, and it feels better, and it sounds better. It’s just a nicer way of DJing. So I mean I’m not going to be like, “Oh, everyone has to go to vinyl.” Obviously I used Serato myself for six years or so, and I still like the product. But at this moment, there’s just so much vinyl coming out, and it’s fun to mix it, and it’s fun to play, and so that’s why I use it. I used it on the mix, as well. I played almost — well, almost everything on the mix is vinyl. And then, you know, a couple things that I played from CD, like new stuff, you know. So it’s cool to have a little mix of both things, I guess. How often do you find yourself playing live versus DJing, and is there one you prefer? If you’re playing live, you kind of have to have the computer there. Yeah. I mean I started playing live when I released my second album, just because I wanted to sort of present the music in a different way. And I had so much music of my own that it was easy for me to sort of compile a “Best of Martyn” for an hour, you know what I mean? That sort of thing. So that’s why I started playing live. And obviously, you have a bit of freedom, as well, depending on how you build your live set. So I played a lot of live gigs around the album, and also the year after. It’s a nice thing for festivals, as well, because usually you only get an hour, and DJing for an hour is fun, but it doesn’t really make much sense, I think. Also, at festivals there’s a lot of people that don’t know your music. So it’s a just sort of much more effective way of presenting yourself, I think: to play live and play an hour of your own music so people can actually hear what you’re up to and what you’re doing. So that was kind of why I started playing live. And I used to do, like, 50-50, maybe, DJ and live. But over the last year or so, I’ve started to play live less and less, just because I wanted to have a lot of new music. So I’m working on a new album, and then once that album is done, I’ll go back to presenting that live again. So nowadays, I think, like, 80 percent of my gigs are DJ gigs. And that’ll probably stay this way until maybe spring next year, when the album comes out. And then I’ll be doing much more live again. It seems like there have been a handful of 12″s and stuff from you for the past couple of years, but it does seem like maybe you’re a little more focused on albums ever since Great Lengths. Is that a fair assessment? Yeah, I think it also has to do with your schedule. And after awhile you just start to play so many gigs that it becomes more and more difficult to get back into the studio. So when you do have time to get into the studio, you want to work on something substantial. But I do really like the album format because you have a bit of time to explain what you’re doing or what you’re feeling or what you want. And it’s nice to have a proper hour of music that you can work on for a long time, and it becomes like a big painting, I guess. And I do like to go really deep into certain sounds or into certain influences and do something with that. You know, for 12″s, it’s much more sort of club oriented, and it’s more like a shorter sort of span of interest or attention, I guess. I really enjoy doing albums, although albums are also very difficult to do and very difficult to finish, usually. But I guess I consider myself more of an album artist than a 12″ artist. Although I do think that beginning of next year or so, I’ll be stepping up production a little bit more, just because I rebuilt my studio, and I’m having so much fun now writing music that I’m actually really productive at the moment. So all that stuff will eventually come out anyway. You have to find a balance between your schedule and your studio time. Do you necessarily see the album as an “event,” or is it just another way for you to package and present your music? Do you think that each album you make necessarily has to be sort of a milestone? Well, it’s always a personal milestone to do another album. There’s lots of people that do 12″s. There’s only a few people that do one album, and then there’s even fewer people that do two albums, and there’s even fewer that do three, and there’s very, very few that go past five or six, you know? I mean in electronic music, at least. I think the album — maybe people would say it’s because it’s a dying artform or a dying medium. But I take people serious when they’ve done eight albums. That’s a serious achievement. Just because I know how much work goes into one. Let alone eight, you know? Because every album is basically a reinvention of yourself. You have to sit down and think about what you want to say with the next album, and try and make some sort of a statement. And that can be a personal statement or a musical statement. It doesn’t necessarily have to be, “Oh, I’m going to reinvent my style or whatever.” Even if you do exactly the same thing as you did the album before, that’s still a statement. So I do think that albums are important, and to me at least, I have a lot of respect for people that are into, like, album eight or nine just because there’s so much work and effort that goes into one. I really enjoy the process of doing them, and it’s good to sort of space them out a little bit so you don’t have an album a year, but to sort of make a new statement every two years or whatever, it’s a nice rhythm as well. You said you’re finding a little more time recently to be in the studio. You have a bit of a renown in the dance music community at this point — it seems like you’re almost always in demand as a DJ. So how do you balance that with the need you might feel to get into the studio and keep making your music? I guess you just have to sort of do it by choice, and start to sort of block off certain times in your year where you can actually sit down and work on music. I don’t like making music on the road. I’m not one of those on the laptop on the plane sort of people at all. So I really have to sort of sit down and get into it and it takes me a few days at least to get back into the studio and get into writing mode. So if I would play gigs every weekend, or even every two weeks, that wouldn’t be enough time for me to get back in there and write actual music. So I started to block off three months and just try and survive for three months and just write music, and then go out on the road again with all this new music and play it. I guess I’m able to do that now, also because I have enough demand to sort of fill up the remaining time in my year and make sure that I also am able to survive. I’m not dependent on having to play gigs every month just to keep everything afloat. And that’s really nice. That’s obviously an amazing position to be in. It seems like music, and especially dance music, is always changing and always in flux, and your music is a pretty good example of that. You’ve switched up styles often throughout your career. How do you view those changes that have taken place in your music and where do you think things might go from here? That’s a good question. I just like new music, so I always follow what’s going on and what other people are doing, and I enjoy listening to other people’s output, and sometimes I get inspired by it. Usually I think my music is an answer to that. Being inspired by a new sound or even rediscovering something really old — my music is kind of my interpretation of that. It’s not really about being on the forefront or even trying to be newer than the rest or doing something different than the rest; it’s just my personal interpretation of it. As far as what’s going to be next, it’s quite hard to say. Most of the interesting music at the moment is being made in the U.S. and not in Europe. That’s an interesting development because it hasn’t been like that for years. It was always sort of London where the newer genres came from, and there’s — obviously for techno, there’s Berlin and other places in Europe. But at the moment, there’s just a lot of exciting stuff happening in really random places, as well, besides New York, where obviously you have a few really strong labels at the moment. I mean there’s a guy from Kansas City, and he’s doing amazing music, you know what I mean? And it’s really cool to see that as well. Out of all these little pockets in the U.S., all of a sudden there’s people with drum machines marching and bringing all this really exciting new stuff. There’s also the sort of lo-fi side of things, which is kind of interesting. It’s sort of like a counter-revolution to the sort of Ableton era, where everyone made music and it all sort of sounded alike. And now you see everyone sort of going back to recording stuff on cassettes and working with broken equipment, you know, just to give it a sort of much more raw edge. I mean that’s not necessarily very new because it’s been going on for a couple years, but it’s a really nice sort of balance with the really sort of sterile music that’s being made as well. Do you ever revisit your older material? Your latest record, the one on Dolly, featured the cut “Oceania,” which definitely reminded of some of your material from 2008. I write quite a lot of music and then just have it sit there for awhile. And sometimes it never sees the light of day, and sometimes it comes back in a sort of rehashed version. Specifically the “Oceania” one, that was something that — it is actually really old, or at least the main ideas of it were really old, and I used that in my live set for awhile. When you play live, you sort of do on-the-fly arrangements of tracks. I always use the bits from this old sort of sketch that I’ve done and sort of arranged it live, and then one day I was sitting in the studio, and I was like, “Maybe I should just record the arrangement that I always do live and just see how it sounds.” And that’s the basis of “Oceania”. Then I just sort of fine tuned it and finished it. So that is actually quite an old track. I do revisit older stuff, but always unfinished stuff. I don’t really listen to a lot of music that I’ve actually finished. That’s why I always forget to play it when I’m DJing — because I never really — you know, for me, once the track is done, it’s done. Then I just let it go and never really think about it unless people request me to play it or stuff like that. As far as unfinished music, either I go back to sketches that I’ve done, or I just record all the stems of old tracks and then throw them in my live set and just use them and see what comes up while playing live. And sometimes that spawns a new idea. I think another track on the Dolly 12″, that “Newspeak” one, that actually existed in a prehistoric form in the live set. And then I just recorded the parts and fine tuned it again. So yeah — I revisit old stuff that’s unfinished, but not really the finished music. There’s not much point listening to your own stuff because you know it inside out anyway. As journalists, we tend to group artists together, but I wonder who you consider your peers are. [laughs] Wow. I don’t know. I mean my peers would be people that I just get along with really well, more than musically — or maybe people that also have a same view of music, I guess. So it doesn’t necessarily have to be people that have a similar sound than me. But I must say that sometimes it is a bit annoying to see who you’re grouped with. Sometimes I understand the similarities, but other times, I’m like, “No. We’re completely different,” you know? But I don’t know. Who would you say would be my peers? Oh, I don’t know. I think probably people like 2562 or people on your label. I think that’s sort of the natural way for people to approach it. You know, that’s really difficult. The thing is, I guess, that when you sort of start releasing records — you know, when I started releasing sort of the more dubstep-type stuff, I was sort of grouped with Dave [Huismans] and Peverelist, Appleblim, and people like that — sort of doing a more sort of lush-sounding, dubstep-influenced blah, blah, blah thing. But I guess from there onward, I think everyone sort of specified their sound and made it more personal and also made it more unique. So now if you compare my music now to Peverelist or 2562 or whoever, it’s quite far apart, I think. So yeah, I think the whole group thing is much more — you know, to sort of put you in a bracket after your first couple 12″s. For instance, someone like Anthony Naples would now be classified as interesting, underground, New York house music, or whatever. But who knows, maybe if he’s three albums further he’d probably have nothing to do with underground New York house music anymore, you know? Everyone goes into their own direction, and I mean, it would actually be better if I had no peers because it would mean my stuff is sounding like me and not like a group of people purveying a sound, or whatever. So I don’t know. Difficult question. I’ll leave that up to journalists. [laughs] That’s better. Your label, 3024, started off pretty much mostly releasing your own stuff, and for the past couple years it’s mostly been different people. What have been your plans for the label? Well, it was kind of freestyle, the way it started. I basically started the label with Erosie, the other guy who does the label with me, to just have an outlet for my own music because I got really sort of pissed off with waiting on other labels to release my music or shopping it around. That’s a really annoying way of making music. So I wanted my own little sort of playground. Then I came across other people’s music or came across other tracks that specifically were interesting to me. And no one was putting it out. I thought, “Well, maybe I can be of service and put that music out there.” Then I started to take it a little bit more serious and do proper A&Ring and approaching people to make music for the label specifically. I think what sets the label apart is that people have sort of total freedom on it, and I prefer to just invite someone to do a 12″, and then they can do something that they might not be able to do on another label. I think there’s some quite good examples of it, where artists who are generally known for a specific sound do something slightly or completely different on 3024, just because they’re able to do that. I think that’s kind of a fun way to do the label. The other thing is that it’s sort of spearheaded by me and represented by me in DJ sets and in the media and things like that. So that also gives it a little bit more strength when it comes to releasing unknown people or lesser known people or young people, because my name is attached to it, and people will be like, “Well, it’s on Martyn’s label, then at least I’ll check it out and see if it’s any good.” So that might help people that are lesser known. So that’s another thing that I really find important, is to find those people that I believe in and give them a shot. Give them a quality 12″ where they’re also free to do whatever they want. The label’s been really steady. It’s been doing really well. It never really got too crazy sales; it never really got too bad sales, either. It’s just a very constant line of doing quality releases and quality artwork, and it has a good following. So it’s fun. And I’ve personally not released anything on there for a while. I think number 10 was the last one I’ve done. And then I did some stuff for Brainfeeder, obviously, and a lot of remixes and various tracks here and there. But I am coming back to the label, so next year I’m going to be doing more 3024 stuff again. And I’m also going to put my album out on the label. So I will be back. Did you prefer doing the album on your own label, as opposed to doing it with a different label? Why did you decide to do the last one on a different label? I was basically invited to do it on Brainfeeder, and at that time, that was a really good decision for me because I was connected to the Brainfeeder family, and we were doing a lot of things together. And obviously, it has a lot of reach, as well, internationally and also in the press outside our own little house and techno scene. People just pay attention to Brainfeeder. So that was one of the reasons why I wanted to do it: because I want my music to be heard by as many people as possible, and that was a good sort of vehicle for it, you know? Plus I’m a good friend of Flying Lotus, and it felt good to do it on his label with him backing it. After that, I guess I started to have a much more sort of back-to-basics approach about things. And I think going back to playing vinyl has to do with that, and my studio’s turned a little bit more analog — that has to do with that. And also just going back to my own label. Because I’m running this label, and why not use that and release my own music on that again? I think it’s a healthy step away from the label, when I did the Ghost People album, but it’s also a very healthy step to come back and use my own label that I built myself to put my music out. On all sorts of levels, it’s just much more back to basics approach. I wanted to ask a couple “what’s in your bag?” questions. So, what are you using as a tool track a lot recently? What’s the record that you find yourself reaching for in almost every situation? You know the label Dixon Avenue Basement Jams, that Rubadub label? There’s a record by O.D.D. that I play almost every time. It’s the orange one. It’s a good, driving house track. Not that much happens in it, but it’s a good builder to something else. That’s one of the tracks that I play a lot. And then there’s a Various Artists on Dolly, and there’s a Steffi track on there that’s also another one that is a real good sort of first-half-hour track. So that would be my two tools. What about about a track that you never expected to work, but you find really actually works on a dance floor? That MGUN record on — is it Don’t Be Afraid? The black and white one. See, I know everything by color… yeah, that’s Don’t Be Afraid number 12. And the track is “Proxy.” It has such a weird bounce, and I play it at home a lot, and I really love that entire record, but I never really thought that would be something that works on the dance floor, but in fact it does. What is the oldest track that’s in your bag regularly and that you find yourself playing out? “Mesopotamia” by the B-52’s. [laughs] That’s easy. That’s by far the oldest track that I play. Do you ever play your own tracks as a DJ? Well, like I said, very rarely because I usually forget about the music, and then never really go back. But if I play an old one, I play “Elden St.” from the first album. And then sometimes I play “Masks,” but I don’t really like the mixdown of “Masks” so usually it sort of annoys me to play that again. I wish I would have done the mixdown a little bit better on that one. But that’s basically the two that I play, if I play anything. And then sometimes I try out new stuff. I’ve been playing a few things from the new album that I’m working on right now, just to see how it works and what the mixdowns are like when you hear it out loud. It’s always different to hear it in a big room, rather than with your monitors or whatever. It always provides a lot of answers. If you’re stuck with a mixdown, then I advise to play it out in a club, and then you’ll probably know exactly what was wrong with it. But yeah, if it’s older released stuff, usually it’s “Elden St.” That’s kind of like a nice, end-of-the-set sort of track, you know, with a nice breakdown and sort of a good, driving track. Is there anything else in particular that you’re feeling at the moment? I really like that Blondes album. Also, there’s a Dutch label called Crème Organization that does amazing stuff. And I also have to big-up another Dutch label called Moustache that I’ve really been getting into. All the older ones, I’m trying to find them all because they’re quite hard to find on vinyl. They’re sort of like Italo-disco records, and there’s some house-y stuff in the as well. So that’s two Dutch ones, and then I like a label called Golf Channel, from New York. That’s something I’ve been getting into quite recently because that’s sort of always slipped under my radar, and I guess because a lot of the music is not really music I would play out. But I have been starting to sort of get back into collecting those records, especially the older ones, which are sometimes hard to find. But yeah, those are really nice records I think. Do you find yourself a bit of a record collector? Yeah. I mean, with almost everyone that makes music or plays music, once you’re focused on something, you just go deep. And that’s the same with record collecting. If there’s a certain label that you’re really into, then you want to have everything of that label. Sometimes I’m a little bit less nerdy about it because, especially in Holland I would be surrounded by my entire record collection, which is a huge collection. And being around it and collecting all this music,you just want more, more, more. But when moved to the U.S., I only moved with, like, a couple boxes of records, and I just started over again, you know? So a lot of my stuff is in storage in the Netherlands. And now it’s slowly starting to fill up over here. So I’m just going sort of house by house — like, once the house is full, then I’ll probably be moving and then going somewhere else and starting over. So in that sense, it’s fun to collect music, but, I guess my collection is a little bit scattered, so I’m less inclined to go deep into it. The digging is fun, and there’s always stuff that you find that, especially living over here, that I was never able to find in Holland or anywhere else in Europe. And the other way around, you know? There was a lot of music from Europe that you can’t find over here. So that makes it fun digging, but as far as collecting, I mean I’m trying to sort of collect other things. Like, I love guitar pedals, so I collect guitar pedals, and there’s just all these things that have my focus at the moment. So I’m just trying to cool down on the collecting bit, because it always — it just drives you crazy, basically. Is there a particular guitar pedal that you’re really into? Well, it was really a very quick and easy way to get into analog gear. Because guitar pedals are usually quite cheap, unless you go for the more obscure, vintage ones. Even if you buy one that you only use once or twice, it’s not like it’s going to break the bank. So it’s a fun way to sort of add a little bit of analog vibe to whatever you are making. Or, you can always put them back on eBay — it’s kind of like trading a little bit. And you have fun with it for a while, and then you can let it go and buy something else. So that makes it fun, and then, obviously, there’s a whole scene of guitar pedal fanatics that go for really boutique sort of stuff or hang-painted or custom-built ones. It goes pretty crazy if you dig into it. But so that’s another thing: I’m trying not to go too crazy on them, but it is fun to own a couple weird ones or a couple vintage ones. My sort of preference goes out to reverbs and delays because I guess I’m sort of like a dub freak. I’ve got a bunch of analog delay pedals. There’s not one in particular? How much is too much to pay for a guitar pedal? It’s a tough one. I’ve seen some mental ones that I really, really want, but, you know, I’m just not going over…. I can’t say. [laughs] My wife is going to read the interview, too. No, but yeah, there’s some crazy pedals for sure. Do you go for the hand-painted, custom ones? Or do you really only care about the sound? I try to only care about the sound. But it’s tempting. I have a few hand-painted ones; there’s a brand called Zvex, and they do really nice, hand-painted ones. They’re really small. They look really compact and nice, and the sound is also really good. But yeah, there’s custom built stuff as well, if you know exactly what you’re looking for and what kind of features you want. There are people who can build whatever you want. Obviously, you’re going to be paying for it, but that parts are usually not that expensive. I’ve been thinking about having a bigger analog delay pedal that I can take on the road for my live gigs — one that just does exactly what I want it to do, with the right chips and the feedback and everything. I haven’t gotten into that yet. Maybe once I start playing live again a little bit more, then I might do something like that. Just have something custom built for yourself and that’s just for you, basically. But we’ll see. What’s up next for you and the label? Well, next week, actually, is Trevino on the label, and then next month is Leon Vynehall, and then it’ll be the single for my album. Then, early next year, it’s going to be my album, and then after that I have another Leon Vynehall release. That’s basically what I’ve been doing: just working on the album, getting that all set up and finished and thinking about hard work, and that’s where I am at the moment. And from next year onwards, I’m going to do a 3024 residency in London. So that’s pretty exciting because then I can invite all the people from the label and people that sort of supported it for a while and just build a really nice little London night around it. And maybe I’ll be looking to do more residencies around the world, just to sort of start building something with the label. So that’s kind of where I’m at at the moment. @myryy Just tried it, works for me. my fault, sorry. Great interview, great mix, awesome fashion skater! Awesome mix, with great unreleased new track ‘Fashion Skater’! And then that Jared Wilson track, man what a beast, pfff.